Taupo rivers on fire !! 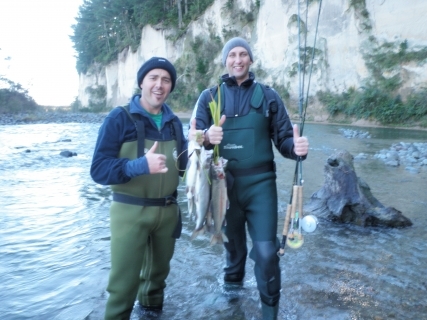 Well we have been saying it for long enough and finally on Saturday and all over the weekend all Taupo rivers saw huge amounts of trout running through them.Â The Tongariro had a substantial flood down it on Friday which with other elements of mother nature set up the perfect conditions for fishing first thing Saturday morning. I was privileged to be guiding Saturday morning and with watching the weather all week I thought the boys were going to hit it just right and that they did. A cold frosty start greeted us when we left Taupo at 7am and thick shades of ice had to be melted from the windscreen, typical of a cold clear night in Taupo with no wind. I knew the river would be busy being the winter, Saturday and perfect conditions but I couldn’t convince these boys to get out of bed any earlier and go without their latte. Knowing fresh fish should have pushed up during Friday and most of the night I thought most fish would be in the lower river or around the Braids so staying low down would be the plan if the crowds let us. The boys had not fly fished before so I really wanted to find them some water to practice in and not be pushed out by other anglers but still haveÂ a good chance of hooking up and getting of the mark.Â I parked up at the bridge and we quickly marched up to the Judges on the true right and saw that one of my favourite backwaters under the willows was available and would not have been fished. There were two anglers in the main run of Judges and one was landing a fish as we walked past so this wasÂ a good sign that they had made it this far.Â A shallow river crossing just for the experience and we were ready to get into it and see what was in the run which with a little bit of colour just looked perfect. This was always going to beÂ a good morning the boys were laughing and joking with each other and Jason which was from Auckland was just blown away with the scenery and was glad to be on the river with his mate Jimbo and out of the office. I demonstrated what I wanted them to do and where they should try fishing and it wasn’t long before the two of them were slashing and frothing the water till it looked likeÂ a spa bath so I slowly individually worked around the two of them straightening out the finer points until they could both lay a decent line. As the water was still sightly dirty and noticeably high we started with big bright orange glo bugs fished underÂ a substantial bomb to get them bouncing on the bottom.Â Jason was the first one to hook up onto a steam train but like many beginners he threw the anchor out and all gear was snapped off by the trout as it disappeared down the rapid hitting the surface trying to throw the hooks. It actually took a few hooks up before they managed to get one in the net but having so many fish running through the pool it was not an issue, weÂ were always going to see alotÂ of trout. Â As all confident fisherman do they were already talking about how to cook trout and how many different ways they were going to be able to make it taste fantastic so I knew it was important for them to take a feed of fresh fish home. With a couple under our belt and the Judges pool now free we moved down and started fishing the bigger water which just happened to be chokers with trout. This for me was a dream come true and I was so happy to be out guiding and laughing having fun with my clients as they permanently had smiles stuck on their faces, it was a great morning. The fish must have been moving through quite quickly as it would go quiet for 10 minutes and then they would both hook up all ofÂ a sudden and then back to quiet again. 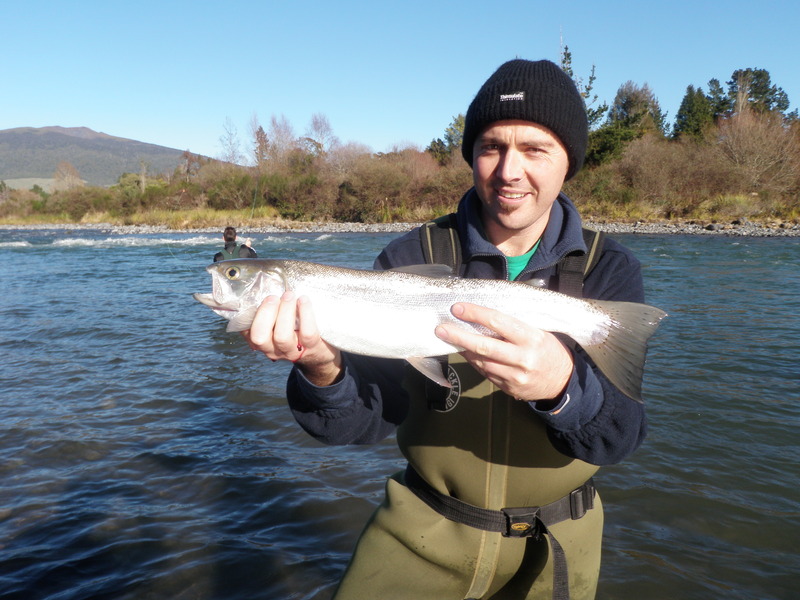 I don’t think I have ever seen quite so many fish caught on the Tongariro inÂ a short period of time. I’m not sure how many they ended up with but well into double figures and it was not just them, all anglers were catching and carrying fish. The majority of fish were in good condition but I must admit I stillÂ netted a few old jacks which looked quite skinny and tired but generally they are much,much,much better than the last two years. Hen fish were fat with eggs and built like footballs and were ranging from 2lb-4lb so not huge fish but heaps of fun. I would expect the river to fish well all week as there must be thousands that went through with all that rain and I cant wait until Thursday when I have a full day guide on with father and son. Reports have been coming in thick and fast with most being very positive in the way of great trout caught fairly easily in the usual spots. Getting on the river still seems to be fairly important especially if you want some quiet time away from others but as you know it’s not essential to catching fish. I am really pleased to see all rivers holding good numbers of fish I have not felt this confident for quite some time before going fishing. 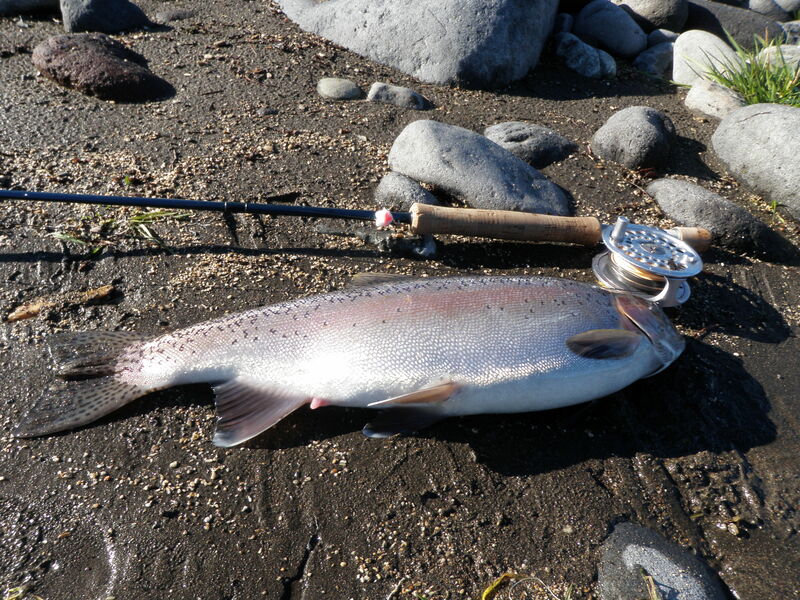 It is wonderful to see good condition silver fish and just as DOC have said andÂ maybe the fishery has turned around and we are going to see better fish this winter compared to the last few. There have always been good fish in the systems but if you are not on the river 4-5 times per week I can understand that they could be a little hard to come across. If you haven’t been up recently maybe you should think about shooting up mid week and get into some of these amazing fish that everyone is talking about.